Because of pirate hijackings off the coast of Africa a big, money-making protection industry has started. There are more and more private security guards working in the oceans, so Hazel Healy asks: is this really the best way to ‘safer seas’? On a windy day last May, a sailor stands on the HMS Illustrious on the River Thames. It was almost a year after the last big hijacking by Somali pirates. Then, the Somalis hijacked the crude-oil tanker MV Smyrni, and got $13.5 million in ransom money – more money than ever before. The sailor thinks about his counter-piracy voyage to the Gulf of Aden, and says he didn’t see any pirates. The ‘maritime security’ sector is at a seminar on the ship. Gavin Simmons, from the UK Chamber of Shipping, says we need the counter-piracy missions to the Gulf of Aden: ‘Shipping was important in the days of free trade and Empire and it’s equally important today,’ he says, and praises the work of the navy. Warships have helped stop Somali pirates. In the first six months of 2013, there were only six pirate attacks. But there are problems with putting a lot of military in the sea. A big private security industry can now see new opportunities off the west coast of Africa. There was a lot of piracy in all the oceans of the world for thousands of years until the mid-19th century. It started again in the 1990s, first with attacks in the Malacca Straits in Southeast Asia, and later off the coasts of Africa. The world’s media showed the many Somali pirate hijackings. In 2011, the International Maritime Organization recorded an average of about one hijacking per week. They didn’t steal but they demanded money. They captured about 3,700 crew (people) and 149 boats, and they got $385 million between 2005 and 2012. The pirates said they were fighting against the foreign boats that destroyed their lobster breeding grounds, and the damage caused by hazardous waste dumped near their country. The first pirates were actually angry fishermen, but the idea of ‘taxing’ ships was productive. Pirates had found a good source of money from global capitalism. The pirates were first based at the exit to the Suez Canal, in the Somali region of Puntland. Then they expanded to cover the Gulf of Aden to the Red Sea and the southern coast of India. They attacked anyone. UN advisor Jack Lang even said they were becoming the ‘Masters’ of the Indian Ocean. They took container ships, big supertankers full of crude oil, and even emergency ships with supplied for starving people. Pirates shared what they got: investors kept half, and the pirates earned medium amounts of money (soon used up by many, very poor relatives). It’s a high risk plan to survive, not an exciting adventure. And in stateless Somalia, there are not many other choices. World powers fight back with military surveillance, deterrence and criminal prosecutions. Since 2008, new warships, drones (unmanned places) and Special Forces have patrolled the Gulf of Aden and the Indian Ocean. NATO, the EU and a US-led task force have military forces there, with ships from 22 countries, including Pakistan, Iran and China. The UN Security Council gave permission for attacks at sea, from the air and on land. Shipping and oil companies fought hard to get protection. But counter-piracy also gave a new purpose to navies at a time of government spending cuts. It also gave countries an opportunity to show their national and regional power. The Gulf of Aden is a good place for a warship: it is the gateway to Asia, and a central point for energy (3.4 million barrels of oil pass through every day). The captured people tell terrible stories. The pirates still have 50. But world powers are not doing this for the Filipinos (most of the people who work on the sea around the world). About 98 per cent of people taken hostage are from the Majority World. They have little protection in the difficult globalized shipping business. There are less crew , they have too much work to do, and they are too tired to be careful on guard. Ironically, the involvement of the navy has made this more dangerous. Since 2008, the number of hostage deaths has increased. They die in firefights and when others try to rescue them. Somali pirates have become more cruel and there are more reports of torture and killings. Piracy is terrible. But many people are also killed by the navy. Some pirates die in hostage rescues – the South Korean navy shot eight pirates when they took back a boat last January, and the Dutch and US navies killed another five pirates. But people say there are also murders. Some say the Russian navy, for example, murdered 10 pirate prisoners. Innocent fishermen are also dying. The Indian navy killed the complete 15-person crew of a Thai fishing ship in 2008. Since then, at least eight fishermen from India and Yemen have died – killed by soldiers or private guards. It is difficult to prosecute pirates. But more than 1,100 are now in prisons worldwide. But it is more difficult to get justice for deaths by the military. The only attempt so far is in India, where two Italian marines working on a tanker will stand trial after killing two fishermen last year. After 2008, pirates moved further out into the Indian Ocean using mother ships. One observer compared it to ‘one police car trying to patrol an area the size of France’. In London, new industries were starting. Insurance against kidnap and ransom suddenly grew into a $250-million business; shippers spent up to $1.7 billion in 2012 on private armed guards. Soon ransoms were only one per cent of direct costs caused by piracy (average ransoms were $4-5 million). Ships were told to defend themselves with razor wire and greased, electrified handrails. These stopped three-quarters of attacks. But shipping companies wanted more. So private security started. Neptune Maritime Security, for example, advertises its guards to stop pirates on ships, saying ‘our guards know when NOT to fire!’ It is part of the private maritime security industry, growing, and sometimes too keen, in the Gulf of Aden over the last two years. In the past, governments did not want guards on commercial boats. They worry about unprofessionalism, but countries such as Britain, the US and Italy now allow armed guards on ships that fly their flag, in areas like the Red Sea. 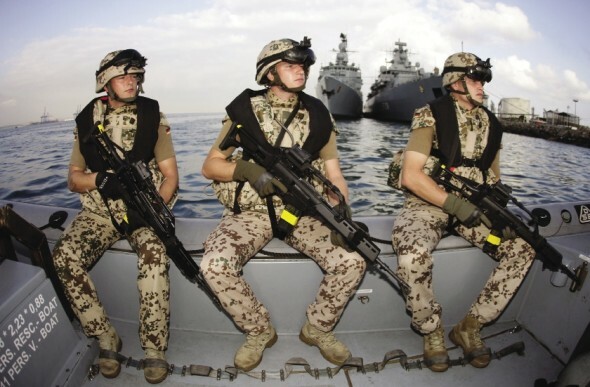 In the Gulf of Aden, there are about 300 Private Maritime Security Companies (PMSCs). At least 50 per cent of them are British, and the guards are mainly people who were in the army or navy before. Firms earn about $52 million per month. Shippers agree to pay $75,000 private security so there are no delays from hijacking. They pass on the cost to clients, and then to consumers. But private security has ethical problems. One piracy expert says, ‘there are stories of boats turned over, bodies full of bullet holes’. There are no controls on these companies. There are no global treaties about shooting from commercial ships. Technically, a ship has to obey the laws of its flag state – the country where it is registered – but there is little investigation into problems, say the International Maritime Organization. Some people say there will soon be a ‘Blackwater moment’ in Somalia (like when private security for the US military killed 17 Iraqi civilians). Campaigners say the voluntary codes of conduct for private security contractors are not enough. They say Britain in particular has started a model of deciding its own policies for its many firms. This will not protect human rights. It is difficult to control the arms with these PMSCs. ‘The UK is exporting more arms - like assault rifles, body armour and pistols to small countries in the Indian Ocean – we don’t know who these firms are or who controls them,’ says Kaye Stearman at Campaign Against Arms Trade. There are now about 18 floating armouries in the Red Sea, Gulf of Oman and Mozambique Channel. These private ships rent weapons outside territorial waters so they do not need to follow weapons regulations. Special Marine Services, a British anti-piracy outfit, has already moved from sea to land to train armed forces in the Somali region of Galmudug. The UN has criticized it for breaking the law in Somalia’s about small arms. The same PMSCs are now trying to move to the problem area of the Niger Delta. The Gulf of Guinea, from Senegal to Angola, has always been a problem coastline, with pirate attacks since the 1970s. But lately, oil theft and robbery have expanded from Nigeria into the waters of other local countries, and further out to sea. Militants with many guns capture oil tankers for long enough to take all their oil to sell to others. Last year, $42 million of oil was stolen. So far this year, there have been 4 hijackings and 31 attacks, so it is lower than in the Gulf of Aden when piracy was worst. But West African oil is now an important energy source (Nigeria alone could produce a quarter of US oil needs by 2015) so it is an international concern. Like in Somalia, piracy in Nigeria also started from communities in the Niger Delta being angry about not having enough resources. Later, it became criminal. But, unlike Somalia, the countries around the Gulf of Guinea are nation-states that function well. And Nigeria, for example, does not want foreign armed guards in its territorial waters. International navies, in this case, are simply increasing their capacity. Foreign PMSCs are now not allowed in territorial waters. But they are fighting for a bigger role. Foreign firms already provide unarmed security advisers, equipment, boats and intelligence and are ‘preparing’ floating armouries. About $150 million was spent on private security in the Gulf of Guinea in 2012. Using the military is unsafe, unsustainable and only helps itself. We should use the money to fight piracy in a holistic, sustainable way. We should look at the main causes: poverty and injustice. The navy should protect the (declining numbers of) fish of West Africa not just oil rigs. Illegal Unregulated Unreported (IUU) fishing is difficult to control, makes it impossible for local people to fish, and brings more poverty to coastal communities. The insecurity and conflict from this are a good start to getting more pirates. Nigeria loses $60 million of state money to IUU ‘pirate’ fishing, every year; the whole region has lost $1.6 billion. Western nations that import fish need to help by making sure there are checks on where the fish are caught, and prosecuting people who break the law. They should also make the shipping industry follow the law, and stop shippers registering with problem flag states such as Liberia, so they do not have to follow labour and environmental regulations. Journalist William Langewiesche says that the money paid to pirates is nothing compared to the taxes that shipping (‘not exactly a criminal industry but an anarchic and amoral one’) would have to pay, if it followed law and order. If illegal fishing is not controlled, more piracy may start. Fishermen in Senegal (their catches of fish have decreased by 75 per cent in 10 years), say they will ‘fight for fish at sea’ with guns, if illegal fishing does not stop. Piracy is decreasing in Somalia, and the foreign fishing boats have returned. Indian Ocean fishery workers are angry at naval ships: the fishery workers help them with information about pirates, but they do nothing to help stop the illegal fishing. We need to defend the resources of poor nations and increase work choices – but these are just one part of the solution. Christian Bueger (international relations scholar) says the most important way to stop piracy will be a ‘peace-building methodology’. This will need to see how complex the problem is and include the local people. Fragile societies can have their own solutions. In Somalia, local people were so angry that they made pirates leave. Somalis who had moved to London angrily phoned the pirates who took hostages; this might have affected the situation as much as the huge World War Three-style ships. We need to think about other solutions – not just hard-security. Maybe we need to accept that Nigeria’s militant pirates are also powerful in politics. We may be able to bring together the different interests. Maybe shippers could think about choosing razor wire, not armed guards, and giving the money they save to a fund for fishermen and their families? Maybe insurers could charge less if they see the community is peaceful? They are starting to catch lobsters again near the Somali coast, but this business needs cold stores and fishing equipment, not the noise of planes above. In the future, we can help fight against piracy with development, not by exporting people with guns. This page was last edited on 14 September 2013, at 16:38.